Code of conduct of Victorian people was related to the very high moral values they had. This can be clearly understood by understanding the elite class and the middle class of those times. They were people who were continuing the family legacy. These people believed in things like individualism. They believed that they were people who were born to rule. They considered themselves as the father of the entire society. They had traditions and status quo. They landed in gentry and they did not work. They just enjoyed the luxuries of life. This was the working class and it was believed that they are less sophisticated and was born to serve the ruling class. 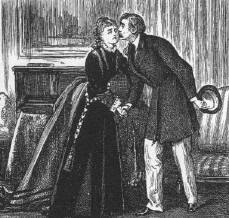 In the Victorian era, all types of verbal and written communication of any form of emotions or any kind of sexual feelings were done in a very polished manner. Some of these letters have also been kept in museums. These families then were largely patriarchal. The husband or the male member has supreme authority and power. This emphasised on the moral conduct of a person. It was created by John Wesley in the 18th century. John believed that a human being had to dedicate himself to causes that were good for the society. He believed in changes and social reforms. This theory was developed by Jeremy Bentham. This theory completely neglected all kinds of human and also cultural values. This theory trusted the reasons that will help in overcoming all kinds of problems. This theory was an attack on the utilitarianism theory. This philosophy was created by Charles Dickens and John Milton. These were the very important figures in the movement. A lot of importance was given to things like education and art because it was believed that the man’s natural talents should be developed well. Milton took an extra step forward and he promoted a series of reforms that were targeted at improving the quality of lives of the poor people who belonged to the lower classes then. Most of these theories were based on the common principles. Victorian era code of conduct was characterised by the progress, reforms, and stability. There were some problems like poverty and social injustice at that time that had gripped the society. Main role was to marry and take part in their husbands’ life. Learn homely skills such as weaving, cooking, washing, and cleaning, unless they were of a wealthy family. Look after the house, cooking and cleaning chores.